The choice of styles we can offer is unlimited but to keep prices low we have standard specifications for different types of staircases. The most economical is to have a staircase with Closed strings and risers ready for carpeting. Our standard material specification will give you a quality staircase as follows. The look of this staircase can cover all areas depending on the materials used and the handrail system. Open Plan ( no risers, good for letting light through, more expensive than standard closed staircases) Open Plan staircases have a restriction on the space you can have open between the treads(max 100mm) you can get over this in a number of ways the most common way is to have a riser down stand this can be straight or curved etc, the next option would be to have an upstand on the back of the tread this would provide the same effect, then you have the option of something like the Stainless steel bar inserts, also Twin riser safety Bars. Openplan staircases overall offer a more contemporary look and would normaly have a contemporary handrail system to complete the staircase. Or something more bespoke like a Cut String staircase, these offer a very traditional look but there is alot more work in the construction of a Cut string staircase and the price reflects this. Choose your opening step detail, maybe a simple bullnose step or a Curtail or a double curtail. 1. the bullnose step makes the entry newel post more sturdy. Choose a handrail system post to post handrail with Square newel posts and Square spindles is the lowest cost option and is proving to be popular with people looking for a minimalist look, the next option would be for turned newel posts and turned spindles we offer a very wide range in this area look at the stairparts section of the website to see the selection. With turned newel posts and turned spindles our standard specification is 90mm Turned newel posts and 32mm Turned Spindles you can upgrade the spindles to 41mm and there are options for Barley twist and Fluted components, one area i can suggest that can transform the whole staircase is to go for the Larger section newel posts and spindles similar to those shown in our Prescott Range , 110mm Newel posts and 55mm Spindles. We can also offer continuous handrails where the handrails are jointed using a number of handrail fittings this also requires turned newel posts and spindles. A new option for people who are looking for a contemporary look is the Fusion handrail system this offers a modern look without breaking the bank, we also offer a style called the European Handrail system if you are looking for a contemporary look this system allows us to create curves in the handrail that can follow the line of the string. If you are looking for a Stainless steel system with glass infill's we work with a couple of other companies that specialize in this area, but this is a Very expensive option. With so many choices to make take your time now to browse the site and decide on what you want. Think about what other timbers are used around the house?. Think about the look you want to achieve?. Are you going to carpet the Stairs?. Are you going to paint part of the Stairs? This is our entry level material and with us using engineered materials the quality of these staircases are unrivaled. Engineered Pine is Laminated pine similar to what you would find in pine furniture (the pine panels are laminated in continuous lamels approximately 45mm wide) these panels are very stable and this gives you a staircase that can be painted or varnished without all the issues encountered with staircases constructed using Whitewood. Parana pine as been the preferred timber for stair makers for many years it is a fairly hard wearing softwood and is readily available in timber sizes to suit staircase manufacturers, it varies in colour quite significantly but usually the face String can be selected to be light in colour to offer a close match to Hemlock, Hemlock is a Clear North american pine and is used by many Stairpart manufacturers to produce Stairpart's (Spindles, Newel posts, handrails etc) due to its stability. For people who like the look of dark Hardwood we currently offer Sapele and we also offer i wide range of stairpart's in Sapele also. 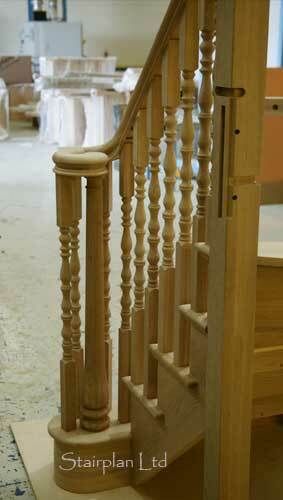 We offer staircases manufactured in Engineered Beech this is currently very popular. The Engineered Beech is a Steamed beech and the material is Finger jointed to achive the lengths required for staircases. 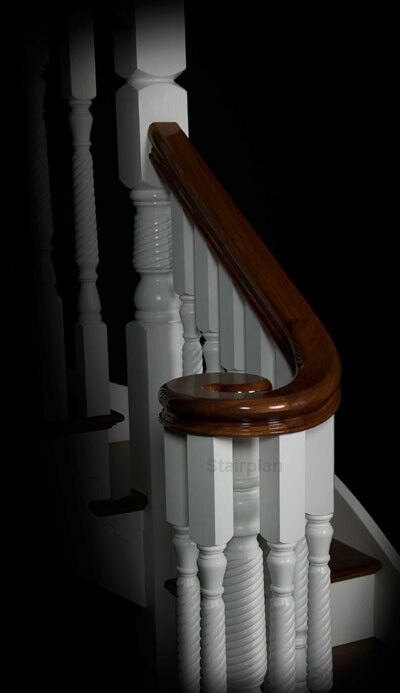 We also offer the European Style handrail system in the engineered Beech and this has the Balusters drilled directly into the strings and handrails (a quality system). The Birgit style handrail system is also an option that suits the Contemporary feel of the Beech Staircases. The Fusion handrail system is also very popular with the beech but this doesn't give you the same quality as the European style or the Birgit. A light coloured hardwood limited availability on standard stairpart's but we can offer a complete solution with Bespoke stairparts. 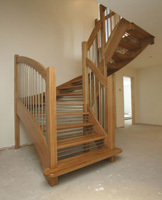 We manufacture our Oak staircases using American White Oak we have a selection of stairpart's also. On oak staircases allot of time goes into the selection of the material, We can offer many different options to the style of the staircase and the handrail styles in Oak. Well as a rough guide if you had a Pine winder staircase costing £1000.00 you would be looking at around £1400.00 in Parana pine with Hemlock stairpart's , £2000.00 if you upgraded the strings and handrails to Dark Hardwood, £2500.00 in Beech with something like the European style handrail and £4000.00 for an Oak staircase this would vary down to the individual staircase and whether you have the treads and risers upgraded as well as the strings and handrail parts. Openplan staircases cost more than closed staircases. To upgrade to a cut string on the face side of your staircase would add £1000.00 + vat. Please note all staircases that Stairplan Quote in Pine or Softwood are constructed using Engineered Pine, this is so we can guarantee the stability of the timber and provide you with a quality staircase. If you can identify a staircase that is similar to what you are looking for from our online library of staircase plans we can give you a price over the phone based on that particular staircase layout and the material specification you require. Left - Oak Cut String Staircase section with our Ascending Volute detail the stair spindle on this staircase is one we produced specifically for this staircase we call it the Deena Spindle we use the latest in CNC technology to produce bespoke spindles for our higher end staircases aswell as offering standard stair spindles aswell as being one of the UK's leading staircase manufacturers we are also one of the leading suppliers of staircase balustrading components. Find the plan closest to your requirements.